The total comes to only $530 on ebay. With the CAT being SS I feel it will outlast the life of the wagon. The catback is aluminized so I'll spray it with VHT ceramic based exhaust primer & paint. I spayed the aluminzed exhaust on my son's 2000 6SPD Maxima 5 years ago and it remains rust free here on the salted roads of the Northeast. The only other direct fit CATs I could find are Volvo, Snaab, Walker, and Eastern. I've read that the Volvo replacement exhaust doesn't last as long as the factory installed exhaust. The SS Snaab CAT costs $636. The aluminized Walker and Eastern CATs are the same price as the Schultz SS CAT. Any members who have replaced their OEM exhaust please give your experience and opinions. Nice find. Good luck. Sadly, I don't see those for my S60. The exhaust from the cat back is poor when buying Volvo replacement. But the downpipe and cat I don't think I've ever heard fail for anyone, not structurally anyway. The flex section on the downpipe is strong. To get the driveshaft off I let the exhaust hang nearly a foot from the rear putting stress on the downpipe. The flange were the CAT and resonator mate is rusted away. If our CATs normally last over 200k I might cut off that flange and slide on strait exhaust pipe. Those links are cheap products, don't be surprise to find a hole after 6 months or so. Plus, the aftermarket cat converter is very cheap, will probably throw a check engine light and not pass inspections, not to mention the bracket may not fit properly. I have restored exhaust flanges with high grit grinding plates and wire brushing but this is near the end of it's life. I might try cleaning it with a stiff wire brush and see if it clears up the bolts enough for extraction. The resonator pipe hanger and muffler hanger seemed to appear in fair shape. Another negative factor is the top side of the muffler is badly corroded. The bottom side must be plated with SS. With the exhaust hanging I could wire brush the top side of the muffler then spray with ceramic exhaust primer. I know the exhaust on ebay isn't high quality. I sent a message to Schutlz to get more information on the SS CAT. For the catback I may purchase Bosal. I could also buy it locally at a shop for $500. That shop offers a lifetime warranty but it's cheap crap that won't last more than 2 years. 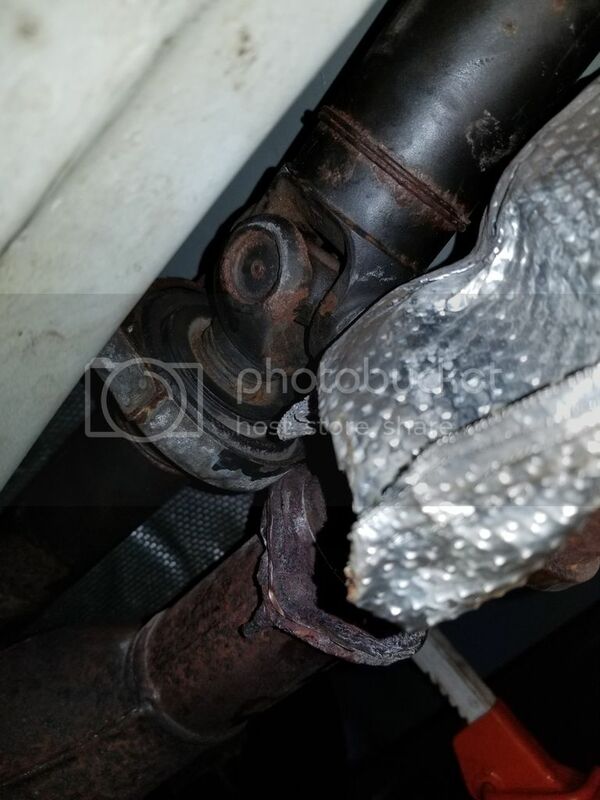 Worth mentioning the flex downpipe is welded to the converter and not easy to replace separately because it must be welded back in place perfectly at the same position, or the flex pipe will stay under stress and start leaking soon. This is why I would be a little worried with aftermarket parts - I now run an aftermarket flex+car and the bracket was badly placed. It's aluminized so I'll add on VHT exhaust primer and paint to slow down the rust. As Orange mentioned the catback I listed in post 1 is cheap crap that won't last long. I was thinking of trying Starla but FCPEURO only sells their rear muffler. I want the center and rear mufflers to be same brand. Last edited by XC70Rider on Wed Apr 17, 2019 7:48 pm, edited 2 times in total. The CAT is SS and the pipes are 14 gauge aluminized steel. They both are made in Ontarioa, SS CAT, and 14 gauge aluminized steel pipe. I decided to get the A1exhaust because they offer a 5 year warranty and are a more active seller on ebay. Not getting the Schutlz SS CAT I listed in the first post becuase they won't communicate. After I drop the OEM exhaust I'll cut off the CAT and keep the downpipe. The flex section and manifold mounting flange are in good shape. If needed for future usage I'll weld on a universal CAT. Last edited by XC70Rider on Wed Apr 17, 2019 12:27 pm, edited 2 times in total. To let you know the Magnaflow 23005 and 49738 direct fit CATs won't fit the 2.5T. Distributors do claim they fit my 2007 XC70 2.5T but after talking directly with Magnaflow they summarized they only fit 2.5L non turbo without AWD. The downstream O2 sensor will hit the driveshaft.